Cooking a steak sous vide means perfectly cooked steaks every time. Fool proof, reliable and oh so juicy! About a year ago, I was gifted a sous vide pod. I had heard about the whole buzz regarding sous vide cooking but hadn’t attempted to do it myself or tried any food cooked through that method (at least to my knowledge). It took me a while to finally try it, as the concept was so foreign to me that at first I wasn’t that excited. Well, I terribly regret not embracing it earlier! Sous vide is life, y’all! 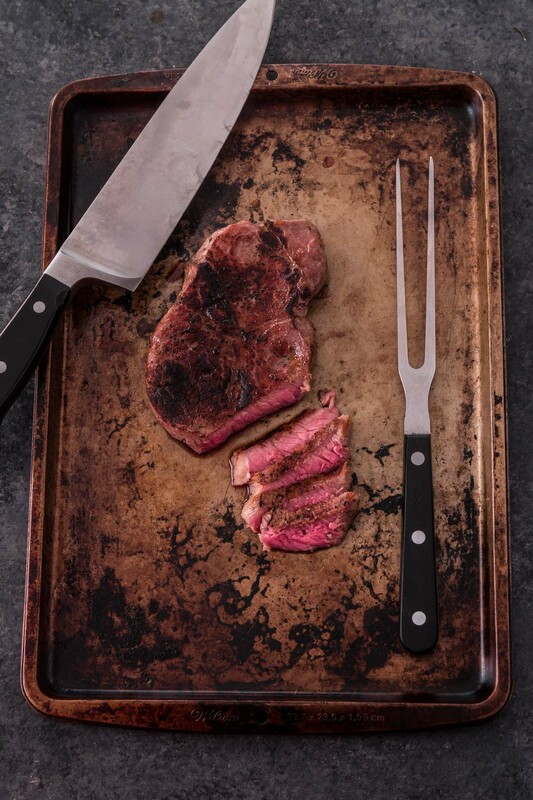 No more guessing if your steak is cooked at the right temperature, no need for a thermometer and no more crying over an overcooked expensive steak. 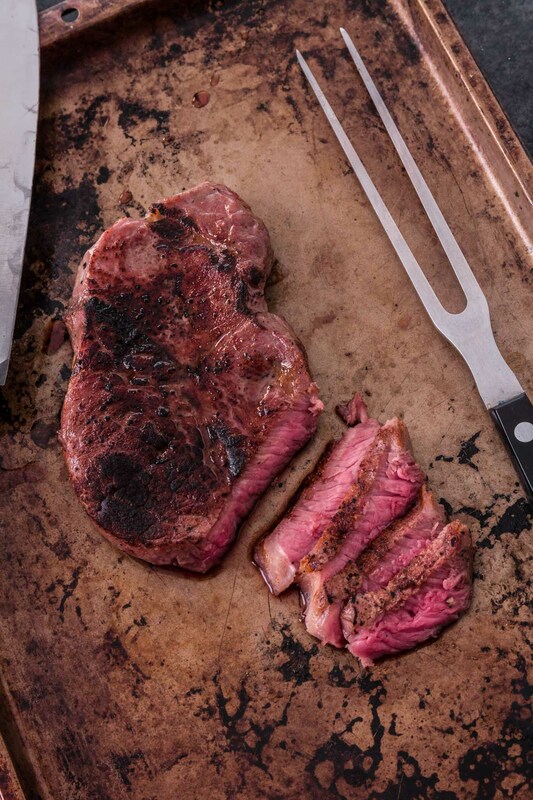 Just perfect, chef quality, juicy steak every single time! If you’re not yet familiar with this technique, sous vide (which is pronounced “sue veed” and means “under vacuum” in French) is the process of cooking food in vacuum sealed bags in a temperature controlled water bath. This French technique relies on precise temperature instead of timing. And is very hands-off, as you set up the equipment, walk away for whatever amount of time you are choosing to cook your food and come back to consistent, perfect results. It is also very convenient as you get to sous vide food before hand and just sear them up right before serving. The answer is: not a whole lot. But you will need two essential pieces of equipment and a pan for searing. 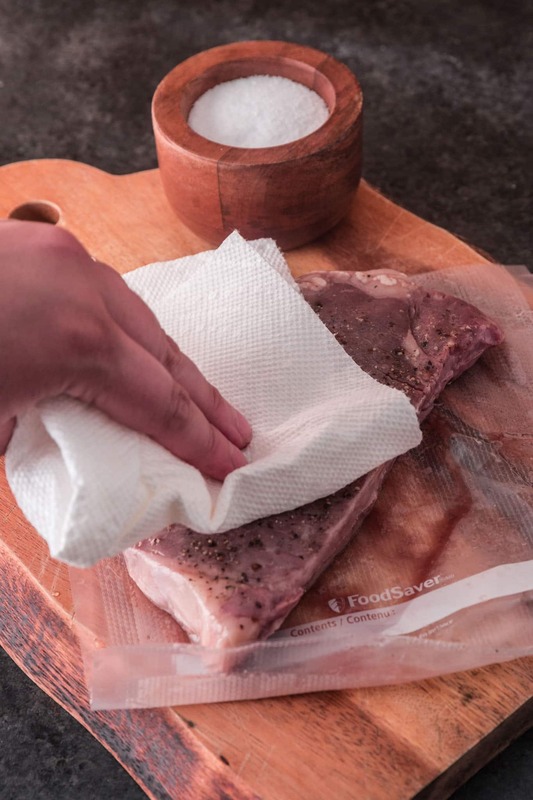 A good vacuum sealing system – After all, you don’t want to ruin your $15 steak by having water enter the cooking bag. My favorite is the FoodSaver® V4440 2-in-1 Automatic Vacuum Sealing System along with FoodSaver® 3PK 11″ Vacuum Seal Rolls. I’m kinda obsessed with my machine. I am guilty of having food go bad more often than I’d like to admit, but ever since I started using FoodSaver®, this problem is not an issue anymore. No wonder they are the number 1 vacuum sealing system in the US! It truly works and is great for sous vide steak and other food as well. 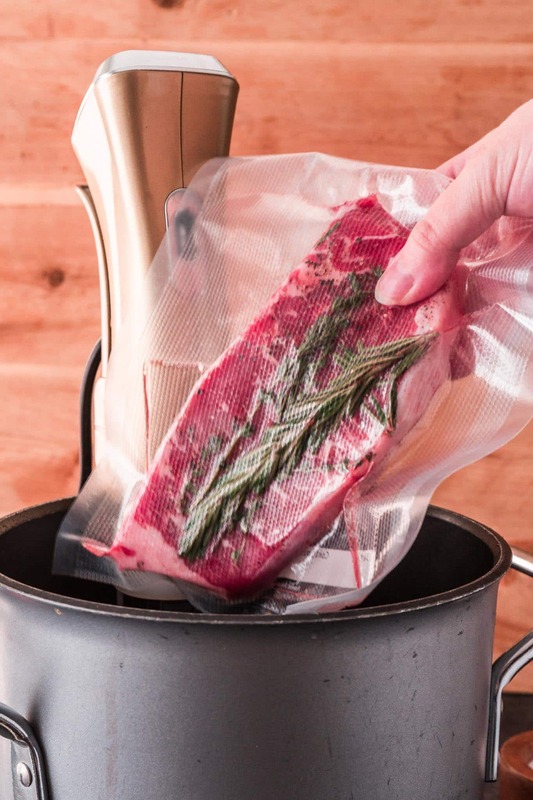 The vacuum sealing system removes air from the bag so that food is protected from the deteriorating effects of oxygen and creates an airtight seal to lock in freshness and protect food from spoiling (or water from getting in when cooking sous vide). The rolls are also awesome as they are specifically designed to withstand boiling temperatures and are very durable, resisting punctures and tearing while cooking. Available in a variety of sizes, they are also safe for microwave, freezer and refrigerator. You can find both these products at Amazon. And because FoodSaver® peeps are superb, you can get them for 20% off from 6/4 to 6/9! Just click the links below or click the products in the shoppable image above. A Sous Vide machine, aka an immersion circulator. This is the device that you will insert into a pot of water. It heats the water to a specified temperature and keeps the water at that temperature, simultaneously heating and circulating the water. These machines used to cost big bucks and therefore were only used at restaurants, but nowadays home cooks can get one for less than $100! 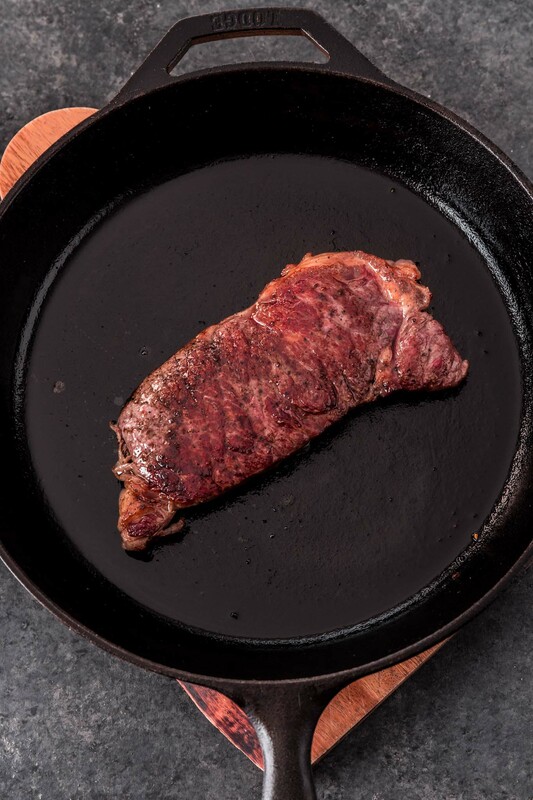 A cast iron pan – for searing the steak after it’s cooked. The chart above is for steaks that are up to 1 inch thick. I’ll try to update it soon for thicker steaks, but in the meantime just know that it will probably take a little longer! Since you are going to sear (or quickly grill) the steak after it’s done cooking in the sous vide bath, I recommend cooking under the desired final temperature, as the searing might overcook it a bit. 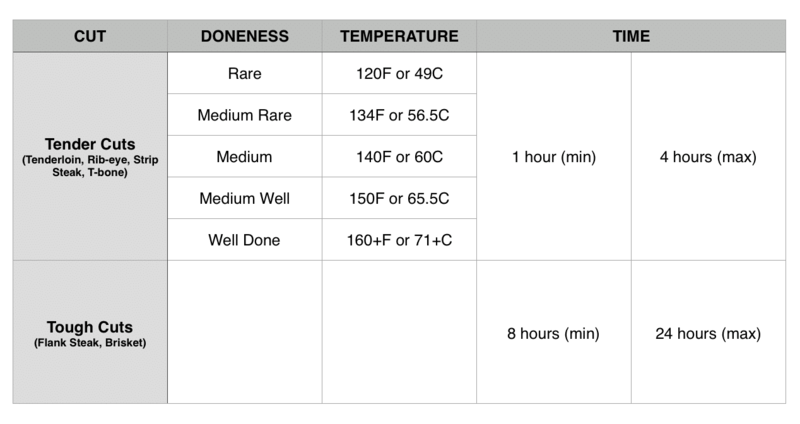 Also, I must advise you that the USDA recommends steaks and roasts be cooked to 145°F and then rested for at least 3 minutes. Once your sous vide steak has cooked for the programmed amount of time, it will look a bit… well, not appetizing! It is missing the crust, the wow factor that everybody likes in a steak. But no worries, just pat dry and then sear it for a minute per side in a pipping hot cast iron or finish it outdoors on the grill. After a few months playing with sous vide cooking, I must confess that I overcooked my steaks a few times, because I was after a nice brown crust. The truth is, if you keep your steak too long in the cast iron, it will overcook and you will lose that perfect sous vide temperature. So I just quickly sear and then finish with a hand torch (one of the ones you use for creme brulee) for some steakhouse-quality char. So, how does it sound? Easy, right? I can’t wait to share other sous vide recipes with you guys. There is a lot to explore and I’m sure you will be hooked as I am! 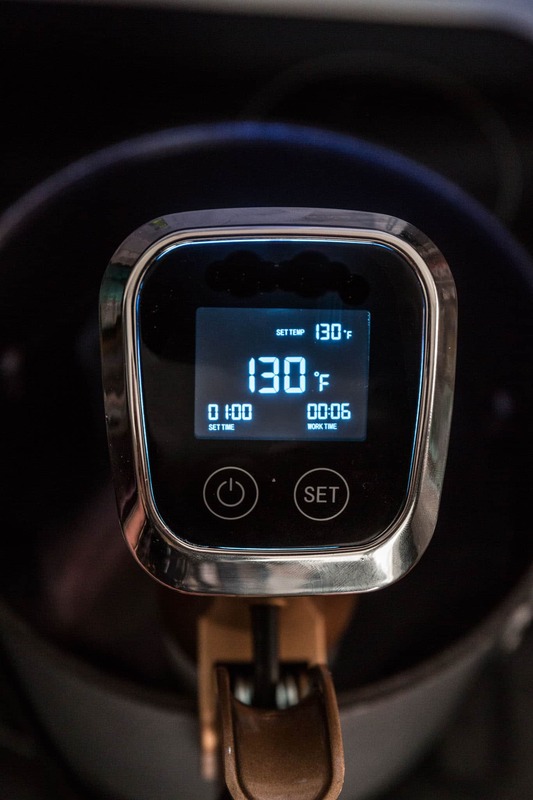 Fill a pot with water and preheat your sous vide cooker to desired final temperature, following manufacturer's instructions. Season the steak and add it to a vacuum bag, along with aromatics (if using). Seal the bag with a vacuum sealing system. Once the sous vide cooker is preheated, add the sealed bag to the water bath and cook for the desired time (see chart in post for time and temperatures). Once cooked, remove steak from the water bath, open and pat dry with paper towels. Preheat a cast iron pan, over high heat, until smoking. Add vegetable oil and sear the steak for about one minute per side. You can add butter at this point, if you wish. You can also add some char to your steak with a cooking torch. Looks delish! Will definitely have to invest and buy one.